On this day in 1890, Howard Phillips Lovecraft was born in Providence, Rhode Island. Perhaps the finest practitioner of the "weird tale" ever to have put word to the page, his influence on the subsequent development of horror, fantasy, and science fiction is incalculable. Even during his lifetime, Lovecraft's ideas were widely disseminated, as his colleagues in the pulps borrowed and expanded upon his imaginary mythology. After his death, thanks to his many admirers and imitators, his ideas were disseminated wider still and are now part of the common pool from which numerous genres draw inspiration. This, of course, includes roleplaying games, including not just the explicitly Lovecraftian Call of Cthulhu, but also Dungeons & Dragons and many others. Had "Grandpa Theobald" (as he sometimes whimsically styled himself in letters) never lived, the course of several genres of literature, not to mention the popular media they spawned, would be very different indeed. As I noted in a previous post, Lovecraft has been a powerful influence on my conception of horror and fantasy. Most of my D&D campaigns include Lovecraftian elements and, while Lovecraft's worldview is about as contrary to my own as any, I still find something powerful in his writing that speaks to me on many levels. Like him, I have strong antiquarian tastes and I recoil at many aspects of the modern age. I also can't help but feel an aversion to the popularization of Lovecraft and the Cthulhu Mythos. When you can buy stuffed versions of the Great Old One in a Santa hat, I hope I can be forgiven for feeling that H.P. wouldn't have been pleased at how his work has been treated. I understand that this is all evidence of many people's affection for Lovecraft and his stories. After all, there'd be no stuffed Cthulhus at all if people didn't love his work. Still, I'm uncomfortable with the way the Mythos has been reduced to a geekish jest in many quarters. But then I'm inclined to treat authors and ideas I like with a fair degree of reverence, so maybe I'm constitutionally ill disposed to find it all in good fun. 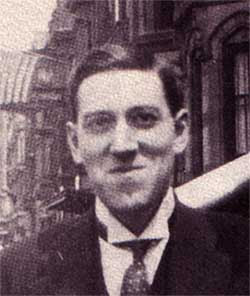 Of course, even Lovecraft smiled on occasion and so today shall I. I owe the old gent a great deal and it's only fitting I should remember him on the day of his birth. I encourage others to do the same. Chances are that anyone who's reading this blog owes him a lot as well. From someone who shares HPL's worldview (at least concerning materalism and atheism, but not including the racism which he backed away from in his later years, to be clear), I seriously doubt he would be pleased by the mass production of Cthulhu plush dolls and like artifacts. Popular culture is intrinsically anathema to an amateur, after all. Still, nice picture of the gentleman from Providence (and one I hadn't seen before), so thanks for that. It is my heartfelt conviction that he would he horrified (and perhaps secretly titillated) to know that he has caused such a stir since his untimely demise. On a personal note, thanks for keeping track of these birthdays and such for me. Just remember: for every stuffed Cthulhu that wanders the planet, there's a Blair Reynolds picture out there waiting to pluck it cuddly eyeballs out and ride it hard until Aldebaran rises. Who is Blair Reynolds? Seriously. I have no clue. What is the source of the photo? Something in print? He is positively beaming in this one, and I'd like to have a copy (other than a printout, your pic is kind of grainy). Is it from one of the Selected Letters books (I only have vol. 5). Those represent his tamer material (although the interiors in Black Sands are NC-17). He also drew for Blue Planet and Traveller, among others, and wrote an excellent short story in the first "Delta Green" collection. So not what HPL was about, but whatever. Yes, seen this before. The first one is especially gross. Lovecraft, Howard, Leiber - THE quintessence, no doubt. Especially last one - when I'm thinking about definition of high adventures. Ambivalent about the mass-marketing of Lovecraft? 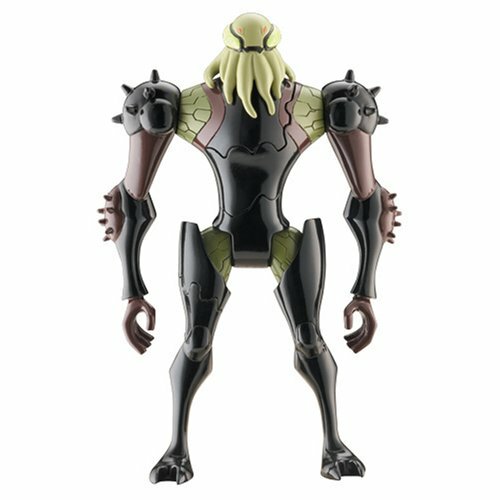 Vilgax. Actually, half the aliens in Ben 10 show obvious Lovecraftian influence. And the hero (a wild, poorly-socialised boy) turns into them, in order to maintain order. It's almost as if there were some sort of hidden message. I also refuse to read anything into the strangely buzzing word ungzzzsy that I had to type in order to post this comment. What is the source of the photo? I'm not certain. I found it on several websites while poking around for an appropriate image to go with my post. I suspect, based on his appearance and the surrounding architecture, that it was taken during HPL's visit to New York in 1922. It might have been taken by Frank Belknap Long or Samuel Loveman, but I can't say for sure. Throw Vance in there and you've pretty much summed up my major literary influences. It's almost as if there were some sort of hidden message. What's irksome is that there almost certainly isn't. Loevcraftian images have now become so commonplace that they're just part of the storehouse from which artists draw when creating things nowadays. I worked in Providence from 1999 to 2002. There will quite the gathering at his grave today (today and Halloween are the biggies). One interesting thing is I see in this and the B/X discussion of the past few days a consistent line of philosophy, which helps the later make more sense. More seriously, I am glad that my perspective on these matters is clearer now. I think it's pretty ironic that Lovecraft himself hated games. Considered them a waste of time. OTOH, he certainly loved 'role' playing both as a child and later doing cemetery readings and the like. Who knows what he would make of CoC, Ben 10 or the plush Cthulhus. I like to think that he would be attracted to the systematic/esoteric nature of rpgs...maybe if he'd come along 30-40 years later we'd see his name on the cover of the DMG. Ah, but I don't find yours foolish and the full quote does include that provision. Although I think it would be funnier if the D&D versions that raise your ire had come with plushies instead of minis. Then again I find Fuzzy Knights hilarious. I was wondering if anyone would point that out. Bonus points to you, sir, for knowing your Emerson. I really enjoyed his humorous side in the reanimator tales. I think it’s a pity he didn’t appreciate them himself. Nothing wrong about that at all, but it's not for me. Actually, HPL very likely did appreciate it, since the latter installments of "Herbert West: Reanimator" were almost certainly intended to be parody. Lovecraft's reputation for humorlessness was undeserved, I think. He had a keen, if somewhat sardonic, sense of humor. There was a discussion on Lovecraft at the Worldcon that was packed - people filled the chairs, sat on the floor, and spilled into the hallway as various folks discussed his works. It was a great experience to see so many people coming together to discuss tihs great author.